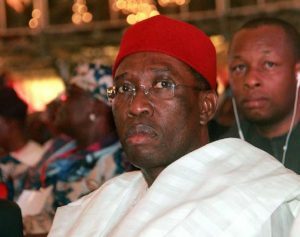 A High Court sitting in Warri, Delta state has adjourned the lawsuit concerning the appropriation of the 50% of the 13% oil derivation fund accruing to the Delta state Government. The case which was instituted in 2014 during the tenure of immediate past Governor, Dr Emmanuel Uduaghan and former State Assembly Speaker, Rt Hon Victor Ochei had unnecessary long adjournments with about four different judges sitting over it under the period. BigPen Online learnt that the current judge handling the case is the fourth among the series of judges who have sat over the matter. The case was instituted by now APC chieftain, Chief Godwin Ogbetuo and former Secretary of Traditional Rulers of Oil Mineral Producing Communities of Nigeria, (TROMPCON), Prince Maikpobi Okareme, Comrade Prince Kpokpogri and Akakasi Oghenejabor Sunday who are the principal claimants for themselves and on behalf of oil producing communities of Delta state. The claimants are praying the court to interpret Section 13 (1) of the Delta state Oil Producing Areas Development Commission (DESOPADEC) Law of Delta state , 2006 as amended in 2007 and 2015 respectively. b. Others development projects, as may be determine from time to time”. After adoption of final written addresses of both parties on Tuesday, the presiding Judge adjourned the case for judgment to one month time to rule on whether the over N300 billion that was allegedly misapplied as at 2015, plus the current shortfall can be retrieved for the benefit of oil producing communities.